For experienced trail adventurers only, and that would be 0.001% of the population, the Dragons Teeth offers a decent challenge. This isn’t your standard DOC marked track. It sure is exhilarating up there amongst the crazy, jagged Dragons Teeth/Anatoki Peak. The good bits: you have two days walking along a long sharp ridge that gives great views: west, right into the heart of the Kahurangi National Park; and east down into the Anatoki valley. 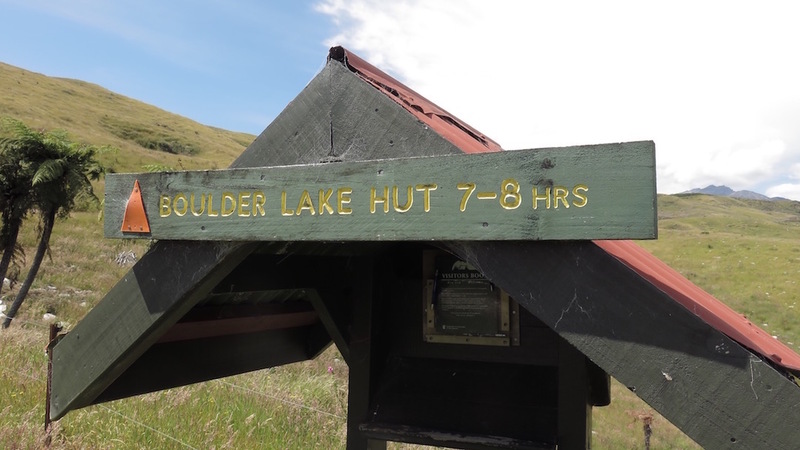 There’s some small, make that tiny, huts for accommodation, some beautiful alpine lakes surrounded by higher mountains: Boulder Lake, Adelaide Tarn and Lonely Lake. It’s not a particularly popular route, not so many people up there. Much of the time there is no one else up there. That is, it’s entirely great. Well, if the weather is good. Otherwise, being entirely exposed to the elements, it really ain’t the place to be. There’s no real marked track except up to Boulder Lake, and south from Kakapo Peak at the other end. The vigilant can follow where others have been along the ridges, there’s no trail shown on the LINZ topo maps. There are occasional rock cairns for the observant. There’s a stretch of nasty scree with a significant drop off at both ends, one at Brown Cow, another under Kakapo Peak that many, most, might find daunting. The Kakapo scree, that’s loose rock on a slope, is around 150 m to scramble across, with a combination of marbles and dinner plate sized rocks, and it sure looks a long way down if you lose your footing. Elsewhere there’s couple of places where you’re searching for hand and foot holds, where those without a head for heights will be considerably nervous. There are two options for the route from Adelaide Tarn to Lonely Lake, note that it is significantly easier to travel in that direction, ie, north to south. One is termed the High Route, climbing amongst bluffs on Dragons Teeth/Anatoki Peak, a few spots climbing steep banks holding onto stray vegetation, not a lot in the 30 m immediately below your feet to raise the heartbeat rate, a rope is useful in places to haul packs. It’s fairly bluffy, particularly if you try to make your own way rather than following the most used path. The Low Route avoids that drama, at the cost of dropping 700 m into the upper Anatoki River, then climbing 800 m past the Drunken Sailors. That’s mostly in forest on an unmarked, actually barely discernible, other than an occasional rock cairn, track, ie, it’s mostly a bush bash due to the limited numbers of parties traversing the route each year. Unless you’re comfortable with scrambling perilously, the Low Route is the obvious choice. Overall it’s a plenty demanding experience, best suited to very fit and able trampers. See the warnings section below. End of James Road, Aorere River valley, near Bainham to the Trilobite Hut carpark near the Cobb Reservoir. It is best to go north—south to avoid issues with the bluffs around Dragons Teeth/Anatoki Peak, better to go up than down. Occasionally there may be snow in winter along the ridges, Dragons Teeth/Anatoki Peak, or on the south side of Waingaro Peak, but it seldom lasts long. Free maps can be found at Land Information New Zealand, LINZ, Topo50 maps, both digital and paper: BQ24 Tapawera, Just the first kilometre, BP24 Takaka and BP23 Gouland Downs. There are some small sections of the northern start of the Boulder Lake track on BN23 Paturau River, actually how to find to the start and BN24 Collingwood. It’s a long, slow and waterless climb up to the Boulder Lake Hut. There is a short tussock bash over to the base of a wide grassy ridge that leads up towards Green Saddle, from where it’s generally undulating ridgetop travel. The main trick is to get through the Eye of the Needle, if you’re heading north the track is not at all obvious. Adelaide Hut to Lonely Lake Hut is the most gnarly section. For the Low Route, follow the main track until it enters the forest, at which point there is a vaguely cairned trail down the slope that follows various watercourses until it turns into the Anatoki River. 10 minutes past Point 744 there is a dry stream on the true right of the river with a large cairn slightly downstream which marks the start of the ridge climb to get up to the Drunken Sailors. This route has cairns at roughly 100 m intervals but once into the scrubby vegetation near the bush line the track becomes completely obvious, at least until you hit the speargrass. The High Route? Well, you’re on your own there, but recent entries in the hut books indicates that the trajectory is relatively well marked with tape and cairns. South from Lonely Lake the track is relatively clear on the ground, easy enough to follow. The DOC Dragons Teeth route website has fairly extensive information, including brief track notes from hut to hut. There are 8 huts along the track. Adelaide Tarn and Lonely Lake Huts are tiny. Here’s the DoC stated tramping times between huts, as shown on their website, usually actual walking times, ie, not taking into account any long breaks. The stated times are close to the actual walking time required. If you can be dropped off at the James Road, err, roadend, what’s the problem? Hitching is possible to or from Bainham, it’s on the road to the start of the Heaphy Track, and the Trilobite Hut carpark, there’s a reasonable amount of tourist traffic up here, at least during the summer months. Golden Bay Coachlines, free phone 0800 588 885 or email info@goldenbayair.co.nz, will take you to Bainham, or maybe the end of the two wheel drive road at James Road for $35. Nelson Lakes Shuttles can take you from Nelson to the northern, or southern end at $70 per person with a minimum of four, ie, $280. Nelson, Richmond or Motueka, have the usual major supermarkets, Countdown, New World, Pak’nsave, for getting the main supplies. Takaka has a big Freshchoice, owned by Woolworths, that stocks most things you would need. They are all open the usual hours 7 days a week. The usually obscurely marked trail is fully exposed to the elements, often undulating around the 1200 — 1500 m level. That might not sound all that high but it is sure not the place to be if wet and windy. There’s a barrier at either end which will tend to deter trampers without a decent level of experience. The steep sidle near Cow Saddle on the way up to Boulder Lake ain’t for everyone. It’s loose underfoot, rocks in clay, a fair drop for anyone who slips, some have been known to turn back despite having climbed relentlessly for hours. At the southern end there’s a sidle across the huge scree slope of Kakapo Peak, about 150 m across. The gravel is steep and variously chunky, dinnerplate or marble sized, and it’s a long way down. This is not really a winter adventure, the south facing slopes of Waingaro Peak are snow grass covered, ie, slippery when wet, or with snow, and avalanche prone in the right, wrong, conditions. If that doesn’t put you off then there’s the dilemma of the High or Low Route. The High Route is best approach from the north, the trail finding is easier if the bluffs are climbed rather than descended. The hut books are full of stories of people coming off the lightly marked trail, there’s only a few cairns to indicate the route, and spending a night, sometimes two, getting around the bluffs. There’s some grabbing onto vegetation with nothing much under your feet. Not recommended for those who suffer from sweaty palms. Some parties carry a rope to haul packs up those sections. You were warned. The Low Route isn’t easy either. There is a lightly cairned route which can be followed by the experienced, but so few use the route there is little discernible trail on the ground. Peel off, ie, down, when the High Route enters the forest and basically follow the watercourse down until a big rock cairn marks the 800 m climb up from the Anatoki River, up a wide ridge through the forest which eventually narrows, and once out of the scrub requires a steep sidle under the Drunken Sailors, through some fearsome speargrass. In general, ridge walking means a whole lot of up and down. Yeah, this one is only recommended for the brave and experienced in following vague trails. It’s the most demanding of skills in any of these routes on the website. DOC has the Douglas Range route website and downloadable brochure, complete with map. Here’s a 50 image slideshow from the Dragons Teeth route giving an indication of the general track conditions and sights along the way, if you need any further convincing. Images of the Dragons Teeth route huts can be found in the other Kahurangi huts section.